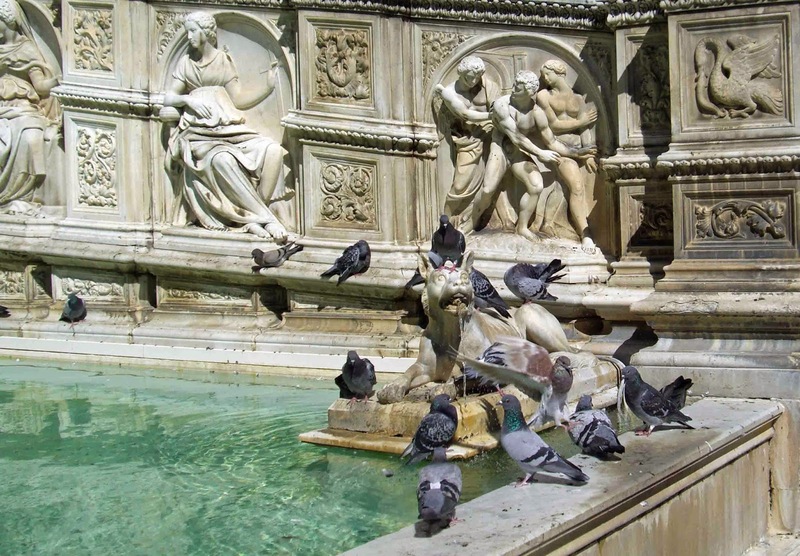 An elaborate fountain sits near the top of the shell-shaped curve of Il Campo, the main piazza in Siena. The original 15th century figures and bas reliefs have been safely carted off to a local museum and replaced with copies. The pigeons don't care. They perch on the ledges and flutter their wings in the spray. They squabble and fight for the right to tiptoe out onto the forehead of the marble wolf, then stretch out a beak to drink from the trickle of water. Sometimes they lose their balance and tumble down onto the wolf's paws. The wolf stares straight ahead, unmoving, oblivious to the pigeon toes and beaks and feathers. He has been sentenced to an eternity of being surrounded by annoying pigeons. I feel a bit sorry for the wolf.